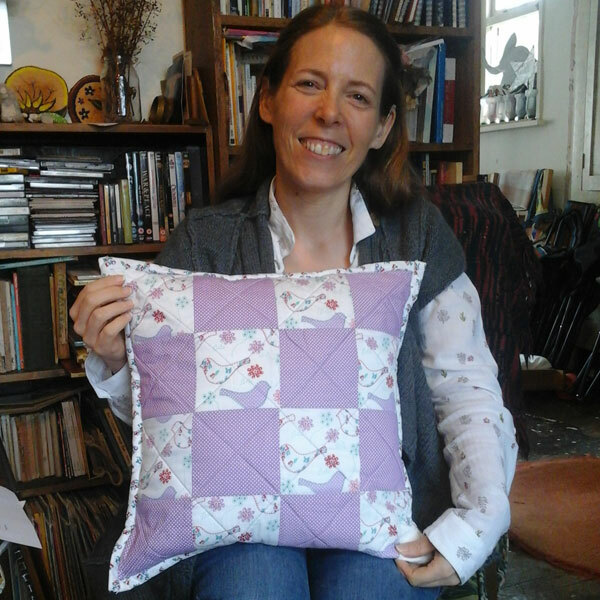 Emma talks about the first quilted item she has made, a patchwork cushion cover for a baby’s nursery. She explains how she made the cushion and how the cushion helped develop her love for quilting and a desire to learn more. 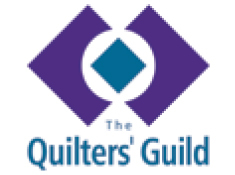 Later she talks about how important social media is in helping her to get ideas and meet other quilters, and the difficulty in finding workshops and groups that fit in with her working life. Bridget Buchan [BB]: [Chatter]. Right, I’m with Emma Ayling, whose Talking Quilts number is TQ.2016.036. Um, we’re actually in my house, Bridget’s house, because Emma’s got to pick up a van later from nearby and that was the most convenient place to do it. So, Emma, you’ve brought a quilt that you’re proud of. 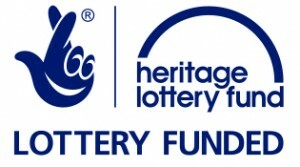 Emma Ayling [EA]: I have, yes. BB: Show me, show me. EA: Yeah, I have. So actually my most proudest moment is my first quilting project, which is where I met you, Bridget. EA: So, um, it was my very, very first project, was going a beginner’s patchwork class at, um, Ely and that was where I first met you and I, the reason why I started to go to the workshop was because I wanted to learn something with creativity. I’m very much somebody who, who’s done a lot of academic work in, in the last sort of ten years, working towards my nursing training, and I felt that it was time to learn something practical but fun and that’s what I wanted to do; and I’m very proud of it because it is something that will go into my nursery when I have my first child, hopefully, in the future. I love the colours, uh, I love the fabric, um, I love the print. It just, that beautiful bird. 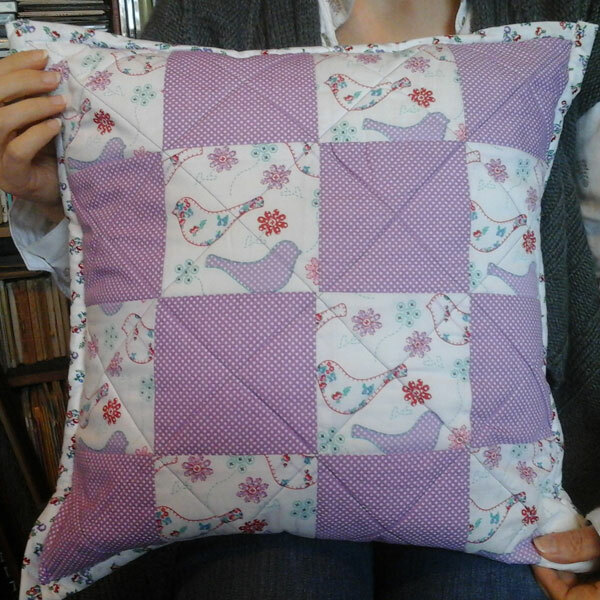 It’s very much an era with shabby chic at the moment [BB: Hmm], um, but I just love the beautiful purple polka dot with the green outline stitching on the fabric and the buttons with crosses and it just, it’s just very much, um… it, I was proud because it was the first item I’d ever made. BB: How did you choose those fabrics? EA: So I knew I wanted, what colours I wanted, and it was a case of once I knew I bought, once I knew that I’d paid to be on the workshop, I had a look online and I just happened to find it online. I mean, actually I have now, I have manage to source more fabric, but in bulk, and I’m hoping to make a, well, another cushion so I can have a pair, but then also to make a baby’s quilt as well to go with it to put in the cot, so, and also do some bunting as well, so I want to really make, make a personalised nursery for when I have my first little one. So yeah, so this is my, uh, proudest moment and my binding, I have to say, has improved a lot since my very first project which, um, but it’s the project that holds the fondest memories because that’s where our friendship first developed and that’s why I’m so proud. BB: …explain about the, the, the, well, the workshop, what the plan was and it, and, you know, describe the quilt that you’ve made. EA: Of course, yep. So, so the plan was, was to do, um, a cushion cover and it was about learning how to piece together squares, um, learning about theme allowance and also learning about the three layers, so learning about your top fabric, the wadding in the middle and then the colour code backing, and then also learning how to quilt using a straight bit sort of diagonally, um, and then also learning how to do an envelope sleeve on the back as well. It’s not, I wouldn’t say it’s the, the, the, the tightest envelope on the back, but it certainly gave me an idea of how to be able to put a quilt together, um, a cushion quilt, quilted cushion together, um, and… I tried to make it a little bit different by using a contrasting colour stitch and I actually used a purple thread to put in line, to keep in, [BB: Hmmm] in keeping with the theme of the colour theme; and then unfortunately I wasn’t able to finish the cushion at the workshop, but you were very kind to come to my home afterwards and you taught me how to put the binding together and quilt it, um, stitching it front and back and that’s where I first learnt in the stitch, stitching, so that was very, and that’s a, a new learning technique for me and, and suffice to say I have made several cushions since then, cushion covers. Um, I’ve made them for my friends, I’ve made them for my family and then, um, actually it’s through this very first project that I’ve developed a love for quilting and sewing generally and it’s given me ideas to learn more and learn about applique sewing and, and learning about sort of quilt blocks and how you piece them together and, and, uh, um, obviously, uh, you know, I’ve been to a couple of the Elysian Quilters meetings as well and, and listened to people talking about how they did fabric dyeing and, and different ways of, there’s, that’s what’s so amazing about quilting, is that there are so many ways of putting a project together, different ways that you’ve shown me where, recently with your toy quilt that you did and piecing all the fabric together and fabric design and fabric printings and, and it’s just a whole world out there and it just… for me… it’s an absolute pleasure to be able to be part of something where it’s a common bond, an interest that every woman that’s involved in, in the quilting and sewing community and obviously with the era of Facebook as well, um, you get to meet lots of people through the Facebook pages and if you’ve got a question, you only have to put that question on there and the responses come up straight away – oh, if you do this, this is how I did it, or don’t do this because it makes it too hard, do it this way because it’s quick and easy – and, and that’s what I love about it is, is the, the friendship that you make. BB: Can you remember when it was, how long ago it was that you actually did that? EA: Yes. So this was in June 2015. BB: So about 15 months ago. BB: Did you do any sewing when you were young? EA: No. No, I didn’t and that’s why, uh, it, it’s strange because I don’t really remember that much of my childhood, really. A lot of my childhood really was more about being outside, being in the outdoors and playing and games and running around. Um, my mother told me I never really had any interest in cooking or sewing or, or anything like that. Um, it’s really only something that I’ve developed in the last two years, where I’ve thought, ‘Actually, I, I want to, I want to learn how to make things with my own hands rather than just go into Debenhams or House of Fraser or the nearest department store to, to buy something.’ I wanted to make personal items, so much so that I’ve got so many projects on the go at the moment and it’s trying to finish them. Um, I’m current, uh, one of my projects at the moment that I’m currently making is actually a baby quilt, so I am at the process where I’m about to be facing the wadding to the backing fabric and then, um, and then I’ll start stitching it. 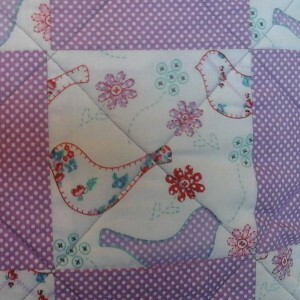 I haven’t quite, I’m not brave enough to do free motion quilting just yet, not for this one. 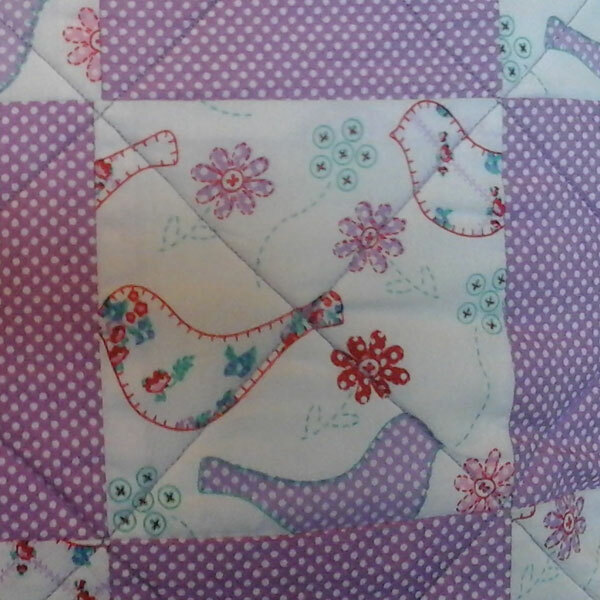 I think I need a, a small project first to have a go at free motion quilting but, uh, it’s a project that I’m very proud of because it’s my first big project, um, for development. BB: So are you going to m, machine quilt it in straight lines like the cushion? BB: Yeah, it sounds like you’re pushing yourself to the, new, new, try new things every time. EA: Yeah. Yes, yes, and… and it can be quite stressful when it, particularly when you’re using your seam ripper to unpick the thing because you can see where you’ve gone wrong. Um, my husband will chuckle at me and laugh and say, ‘I bet I could do a better, a better project than you can.’ But actually for me, that’s all part of the learning experience and, and I, and I get a lot of pleasure from it. It’s so much a stress release for me. BB: I was going to ask you about that, ’cause I know you have quite a stressful job. EA: Yeah. So, so I actually work as a nurse, uh, within the Rosie Maternity Hospital at Addenbrooke. Um, I’m actually a gynaecology nurses, um, and in the area that I work within gynaecology, it, it’s very much an emotive environment and whilst it’s not stressful physically, it is quite stressful emotionally. So quilting and sewing projects me is a, a way of releasing that stress but in such a way that I’m rewarded with the pleasure that it gives me to, to have a finished product. Um, and now that I’ve discovered this hobby, it’s something that I hope I can carry with me into my twilight years as I get older, um, so yeah. BB: … the cost of them sometimes is a bit concerning. EA: It is, yes, and, and I think, um, also the downside of working in a nursing profession, uh, personally where I work at the moment, it’s shift work so I, it, if I can find a way of being able to join a group where you meet maybe once or twice a month, that I can hopefully arrange my shifts so I can say to my boss, ‘Can I not work those days because that’s when I’m going to be going to my quilting group in the evening?’ Um, I have tried contacting a group locally but I haven’t had any responses yet, um, so, um, I’m hoping that I can find a, a group, uh, if it’s not in my home town where I live in Downham Market, then somewhere nearby, because as much as I have enjoyed the pleasure of looking things up on Pinterest and Facebook and, you know, the computer is a wonderful resource, there is nothing like being with a group of like-minded people and chatting and, and getting ideas and just batting off ideas and thinking, ‘Oh well, why, why don’t you try doing it this way because then you’ll get a better finish,’ that kind of thing. Um, one of the things I’ve learnt, not just in life but also through my nursing training as well, is that human beings have a need to be nurtured by other human beings and that’s what’s so great about quilting, because it just… that’s a positive area, um, uh, of, of communicating and interacting with people and, and that’s what I crave and, and that’s what I love, love doing. I love being with people, I’m very much a social person, um, and it’s nice to meet different people from all wal…, from all walks of life. [Microphone noise] You’re all brought together by a common bond. BB: Have you… this is me enquiring, really, but have you felt that there’s not enough younger people? EA: Definitely. Um… personally [coughing in background] in the, in… with the workshop that I went to when I, where I first met you and I, and I have been to a couple of other workshops since then, um, I’ve noticed that a, I, I seem to be one of the youngest in the group, um, and it seems to be women that are ten years older than me and then onwards that seem to be interested in, in, in quilting generally. Um, so it would be nice to be able to somehow make it attractive to people of my generation and I think that, that, that is doable because it’s very much the generation where, my generation is wanting to pick up the sowing machine and they want to learn how to make practical projects at home and, and curtain making and making clothes at home to fit their shape and, and with the likes of Kirstie Allsopp on television with her Kirstie At Home and, and all the crafting fairs that you have, um, during the year, I think it’s something that… other people my age would enjoy very much [BB: Hmmm]. But it’s how you attract them, I suppose, I think. Um, for me it was just simply a case of I just wanted to learn something different and I took a punt and went for it, um, and by doing that, that’s opened so many doors for me, um, and, and I’m quite grateful for that. EA: That’s ok. Thank you. BB: Thank you very much [chatter].